Mixed uses, walkability and amenties – “Young professionals are demanding urban amenities with options for shopping, dining, fitness, and the all important cup of gourmet-style coffee.” This will be a welcome change for those all too familiar with the one-dimensional tech office mecca known as Tyson’s Corner in Norther Virginia. Design for all – contemporary and classic – “To hit the heart of the market, trendy designs should be avoided.” This about making the place look like it’s for people, the exterior aesthetics and public spaces. This includes pedestrian plazas, promenades, outdoor dining areas and human-scaled elements like awnings, benches and lampposts that communicate this is a place for people to be in, not pass through. Emphasis on office functionality and comforts – “Take cues from winning properties of the past decade… for example, industrial and warehouse offices [with] authentic, historic character, but also large, boxy interiors with high-quality finishes, tall ceilings, and big windows that let in plenty of sunlight. Also, the mobile, networked knowledge economy is requiring flexible office space with more collaborative space, conference rooms and shared desks, even cafes, lounges and terraces. Efficiency and sustainability – Everything is going green, and offices are no exception as companies invest in denser working environments with shorter commutes, as well as the latest green building tech. Creative financing – Public private partnerships are the financial vehicle of necessity. “In most cases with a public agency retaining sole title to the project”, as the new generation of workers demand workplace districts that serve the public as much as the private sector. 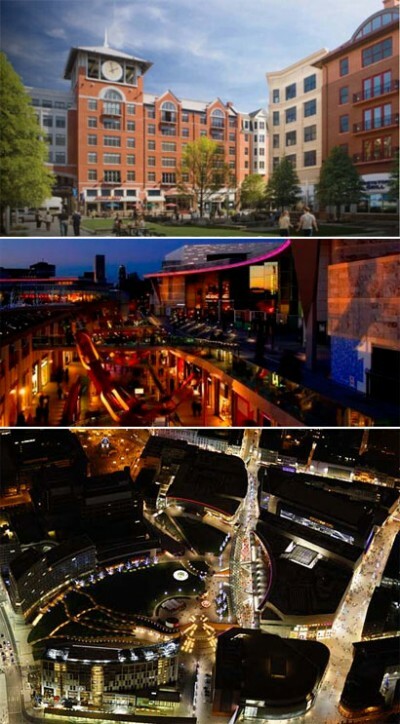 Images of Liverpool One in England. Notice the lack of cars.